Fernando is the master mind and the key person to initiate and successfully spread the EDS-ETC program through several EDS Chapters and institutions around the globe. 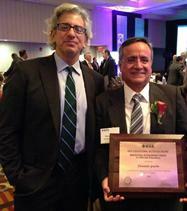 He received the award at the EAB Awards Ceremony, November 22, 2014, which was held at The Heldrich Hotel and Convention Center, New Brunswick, New Jersey. 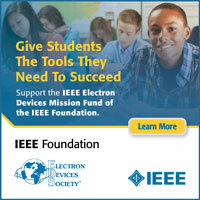 The U.S. National Academy of Engineering (NAE) announced the election of its new members on February 7, 2013. We are pleased to recognize the following EDS members who were elected to the NAE. Anant Agarwal: President, edX (online learning initiative of MIT and Harvard University), and professor, electrical engineering and computer science department, Massachusetts Institute of Technology, Cambridge. For contributions to shared-memory and multicore computer architectures. Eric R. Fossum: Professor of engineering, Dartmouth College, Hanover, N.H. For inventing and developing the CMOS active-pixel image sensor and camera-on-a-chip. Robert S. Chau: Intel Senior Fellow and director of transistor research and nanotechnology, Technology and Manufacturing Group, Intel Corp., Hillsboro, Ore. For contributions to CMOS transistor technologies for advanced logic products. A private, nonprofit institution, the NAE has more than 2,250 peer-elected members and foreign associates - senior professionals in business, academia and government who are among the world’s most accomplished engineers. Those of us in EDS can take pride in the accomplishments of members like these and draw inspiration from their work to continue, in the words of EDS’s vision statement, promoting excellence in the field of electron devices for the benefit of humanity. Congratulations, gentlemen. You make EDS proud. It is with great pleasure that EDS recognizes Jayant Baliga, Rakesh Agrawal, and Michael F. Tompsett for receiving the National Medal of Technology and Innovation. As the United States’ highest award for technology innovation, this is indeed a great honor and no small tribute to their outstanding careers. EDS congratulates Jay, Rakesh, and Michael for their achievements. It is an honor to count them among the society’s membership. 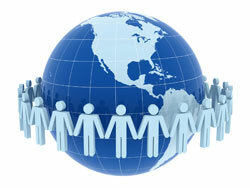 EDS members make enormous contributions to not only our field, but to the world at large. We take particular pride when our colleagues are recognized in an extraordinary manner, such as these recent awards given by President Obama. Our The National Medal of Technology and Innovation recipients join other illustrious EDS members who have made vital contributions such as Nobel Laureates Charles K. Kao, Willard S. Boyle, George Smith and Herb Kroemer.